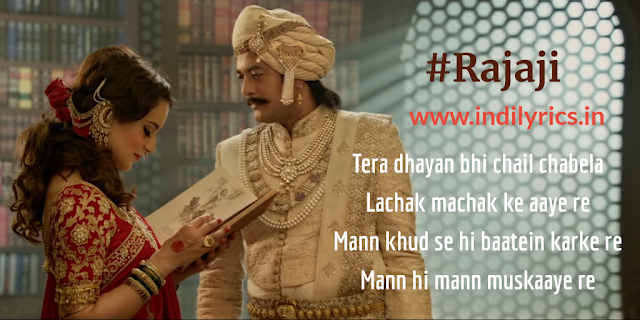 Naina ChughalKhor Rajaji Full Song Lyrics with English Translation and Real Meaning Explanation from upcoming Bollywood movie Manikarnika, this soothing love song is wonderfully composed & written by the famous trio of Shankar-Ehsaan-Loy while Pratibha Singh Baghel & Ravi Mishra sang this song, and the delightful flute music is played by Naveen Kumar, the music is available on Zee Music Company. The movie Manikarnika stars Kangana Ranaut, Jisshu Sengupta, Sursh Oberoi & Danny and others in lead roles, the Audio mp3 version of Rajaji from Manikarnika as well as other songs are free to download and stream from Gaana, Wynk Music, JioSaavn and other online music portals. What kind of strings are these you woven around me? What did you do to my heart o my king? Mann hi mann muskaaye re..